Mushroom risotto with smoked salmon 5 out of 5 based on 1 ratings. 1 user reviews. Italian cuisine is famous worldwide for its traditional dishes, such as spaghetti bolognese or spaghetti carbonara, risottos, milanesa, tiramisu, pizzas, handmade raviolis, gnoccis … The list is very long. It is such a wonderful cuisine, with variety, healthy and colourful. To sum up, I love it! Italian cheeses are also incredibly delicious, like the gorgonzola, the parmesan, the ricotta or the mascarpone. 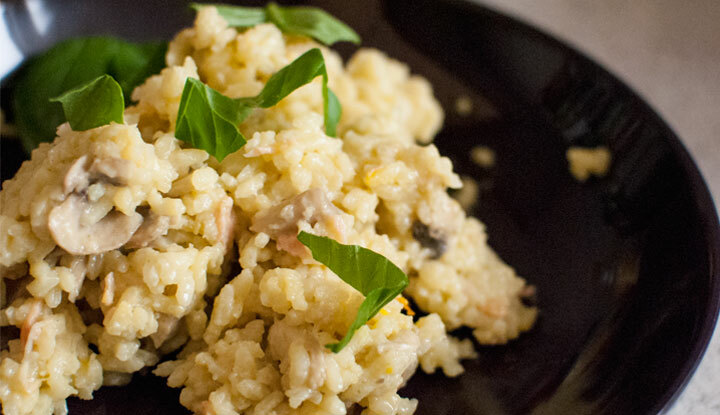 The mushroom risotto is along this list, one of the most popular Italian recipes. 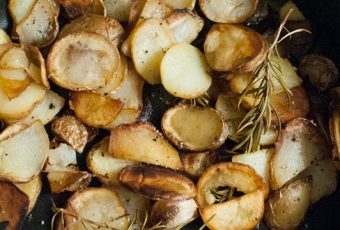 When I cook I like to mix the flavours, adapt a technique to another dish, add a personal touch … And Italian cuisine is an incredible opportunity to play with delightful ingredients even if Italians don’t really like it. That’s how I found an original way to modernize a traditional mushroom risotto, enhanced with saffron, which gives it an oriental touch, and smoked salmon. How to make a good mushroom risotto? It is a very simple recipe, that just requires attention while you are cooking the rice. This recipe can be classified in the category “How to make someone eat fish who doesn’t like it”: the smoked salmon doesn’t have a strong seafood flavour once it is wrapped into more classic flavourings like rice, saffron, white wine, mushrooms and cream flavours. With the leftovers, you can make risotto croquettes: shape medium size balls, pass them through the breadcrumbs and fry them in a pan. It’s very easy! The broth has to be slowly incorporated all along the cooking process. That’s why you have to watch it throughout the cooking, mixing regularly to make it creamy. If you plane to have a starter before the risotto, prepare before dinner all the steps until you almost incorporated the broth, means you turn off the heat and keep about a couple of ladder. 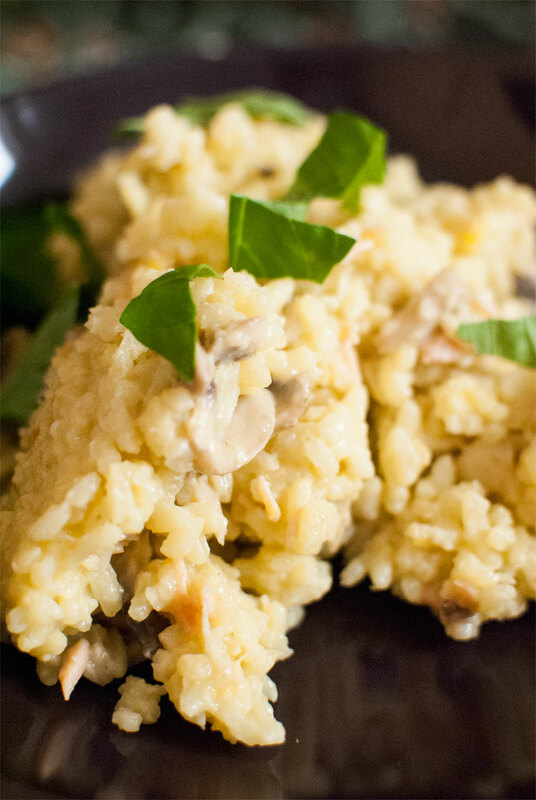 Once you are ready to eat the risotto, heat the pot again, finish to incorporate the broth and the rest of the ingredients as per indicated in the recipe. I like to decorate the risotto with basil leaves or parsley to make it look nicer by bringing a touch of colour, but it is completely optional. Pepper, ground coriander seeds and any other seasoning you like salt, nutmeg. Heat water for the broth in a kettle while preparing the rest of the ingredients. Clean and cut the mushrooms into pieces, and put them aside. Cut the onion into slices, chop the garlic cloves, and sauté them with the butter in a large pot until soft. Stir the mushrooms and cook over a low heat for about 10 minutes, until the mushrooms are tender. While the mushrooms are cooking, cut the smoked salmon into strips, grate the lemon zest and the parmesan cheese if necessary. Add the rice and the saffron to the pot, and stir together until the rice grains are translucent. Pour the white wine, mix and let it evaporate completely. In the meantime, pour the hot water in a large bowl with the broth cubes. Then add the broth slowly, as per the following: wet the rice with a ladle of broth, stir and cook until the broth evaporates. Pour another ladle of broth, and repeat this operation until the rice is cooked, stirring regularly so that the mixture remains consistent. At the end of the cooking, the rice should be soft and a bit firm at the same time. Once the rice is cooked, incorporate the cream, the grated parmesan cheese and mix gently. Turn off the heat. Just before serving, add the smoked salmon, the lemon zest and garnish with basil leaves. The risotto must be served immediately, very hot.